Greetings from the School of American Ballet. I am writing to invite you to become part of a very important program at SAB. As a new component of our ongoing diversity initiative, we are currently in the process of forming a committee consisting of a select group of alumni who are active in the dance world. Members of the SAB Alumni Advisory Committee on Diversity & Inclusion will be asked to provide input to help shape and enhance SAB’s ongoing work to broaden recruiting, outreach, and student life programs, with the ultimate goal of increasing diversity on ballet stages around the globe. I believe that your experience and insight into SAB and the broader dance world will be an invaluable addition to our efforts and sincerely hope that you will accept this invitation to become a member of the Committee for its 2015-2016 inaugural session. SAB’s Diversity Program Manager, Leah Qunitiliano, will reach out to you next week to discuss in more detail the goals and expectations….etc. Hi Leah. I have been giving the matter of whether or not to join the Diversity Committee some thought. With all do respect, if the School of American Ballet is serious about diversifying, they can start by hiring me as a ballet teacher. I am great. This is not about me, and it is about me. Please tell Peter Martins that true diversity means the whole structure has to change. Is he ready for that? All the leaves have eyes. One day, while driving around in the Grey Pearl, I wanted some company, so I switched on the radio. The tape and cd player haven’t worked in ages, which doesn’t stop me from having tapes and cds in the car. I can’t bring myself to get rid of them. It’s sort of like keeping a picture of an old person from when they were young. You want to remember them in their glory days. Or maybe I just want to remember myself that way: Tai and Natasha driving downtown on the FDR listening to Missy Elliot, Tai driving to Boston for the first time listening to Destiny’s Child, etc. The Grey Pearl is at the point in her life when I’ve stopped fixing things. She’s all meals-on-wheels-y and has the eau of stale popcorn and wet dog. I take her out once in a while for a slow drive to the Stop-n-Shop. The radio still works as long as you don’t have the wiper blades on, the lights on, or the defroster on. She can only handle one function at a time before she starts screeching like a Nazgul, a sound so ghastly, it makes even the hardest homie on the corner cringe with fear as I roll by. It’s hard to mention the Grey Pearl without indulging in a bit of nostalgia. But this is not about her. It’s about what I heard on the radio that day. It was a sunny day. I risked the radio without a complaint from Pearl. I tuned into NPR with me and Pearl cruising along at 30 mph. Good times. The moment I switched on the radio, I heard a male voice say, “If you want to write, you have to write every day. Around the 21st day, something happens. It takes on a life of its own.” I took this as a sign. I drove home with images of how I might transform into a Rumi or a Murakami after my twenty-one days of writing. One day they might even interview me on NPR! I wanted to take on the challenge. I tried to write every day, but some days I just couldn’t. I didn’t feel like I had anything to say. I gave up, boo hoo. I’d heard from writers before that in order to grow, you have to make it a daily practice, but I could never assume that discipline. I mentioned this to an artist friend of mine who suggested just writing without any agenda. Without the need to share it or even have it make sense. Just practice every day, even if you write the same word over and over again. Let’s keep dancing, shall we? And don’t forget the world of art! A fiction, unicorns the same. His words freed me. Writing became a part of my daily practice. I found that because I had to write things down, I could not avoid anything. What I mean is, often when I feel blue let’s say, I try to avoid or change this uncomfortable feeling, but I found that, in the space of avoidance, I couldn’t write. Not even a stream of consciousness. I had to write the truth of what was and somehow the writing of it allowed me to process it and move on. I know this is nothing new. That’s why people keep journals. It’s just new for me. I became interested in the process itself. I started out printing by hand. Then, a day or two into the twenty-one day challenge, my writing switched to cursive, mid-sentence. Then one day, I started writing vewy vewy small. I am so lonely. 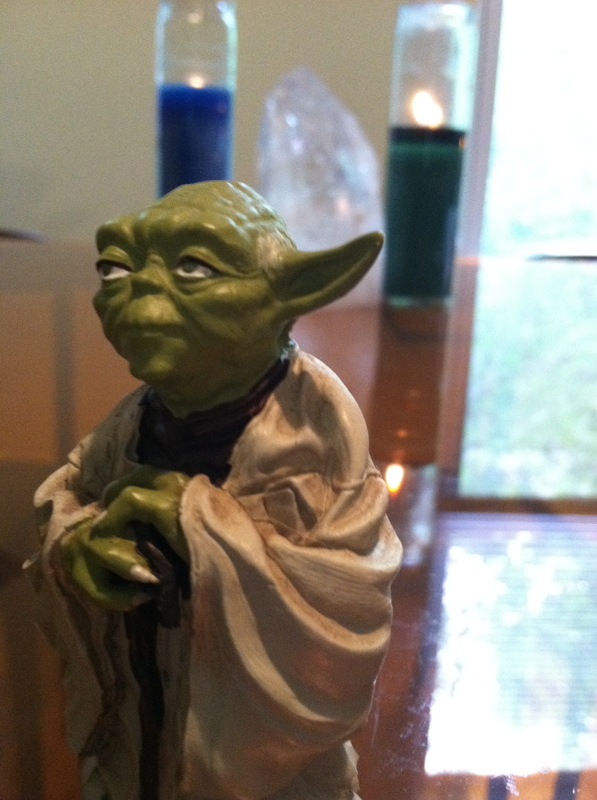 I am Yoda’s little brother, only five hundred and eighty-seven years old. I am not a Jedi like my brother. I am an alcoholic. The rest of the family does not talk backwards like Yoda. We speak in straight sentences. Our father tried to beat it out of him, this quirkiness of speech. He said it’s a big waste of commas, so Yoda ran away. I cried. I begged him to stay, or take me with him. He said I was too young, only eighty-seven at the time. That’s young for us Yodas. Yoda, incidentally, is the family name. The one you call Yoda is Clavsti(((comb Yoda. It’s hard to pronounce in your tongue. Before he left, he gave me an (((-))) 8, which is a kind of seventeen legged creature from our planet. It wasn’t a real (((-))) 8, but fashioned out of mud and aluminum foil. By swinging it in loops from its tail, Yoda said I could contact him wherever he was in the universe. At night, I like to swing my (((-))) 8 by its tail and talk to my older brother. I like to believe that he can hear me, wherever he is. Sometimes I hear stories at the bar about the great Master Yoda, about the battles he’s fought against the empire. I like to wave my three-fingered fist in the air and cheer him on: Go Clavsti(((comb! All the snakes are out.